Denton Gerow lives in King, NC where he spends his free time pursuing creative expression through woodworking. 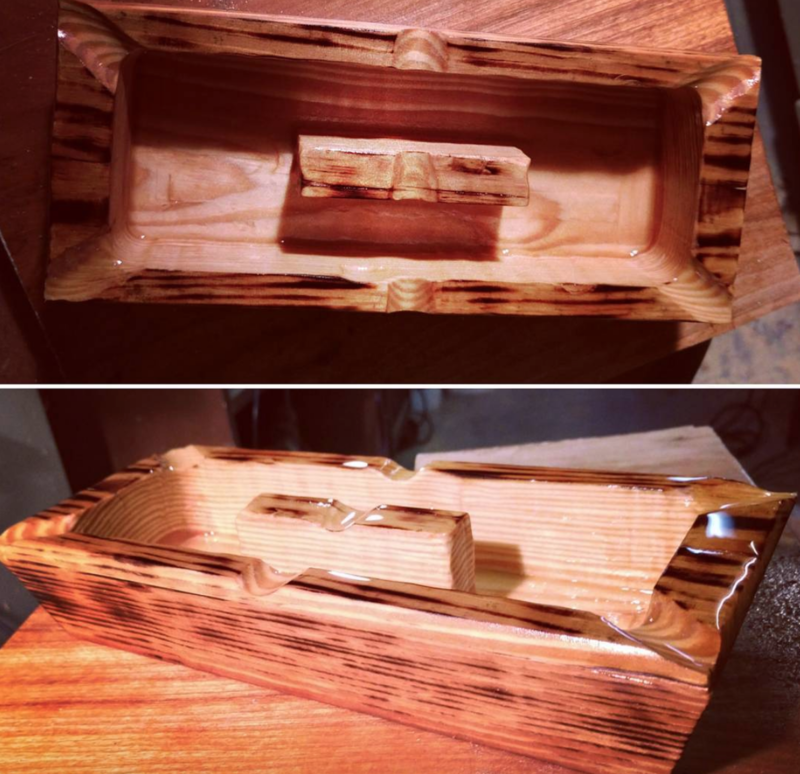 The woodworking gene runs through his family. “A lot of what I know I learned from my father and my [grandfather],” says Denton. His grandfather was a carpenter who was a part of the Seabees (construction battalions) of WWII. Denton and his father built a number of parts for their model train layout when he was a child. His father also refinished most of the antique furniture that’s still in his mother’s house. “Doing things with wood was something I learned early in my life,” he says. He reads multiple reclaimed lumber blogs and he’s met a number of artisans at local craft venues. He says that he tries to be inspired by others’ work and learn from their ability to create fantastic products out of “junk” or throw-away materials. 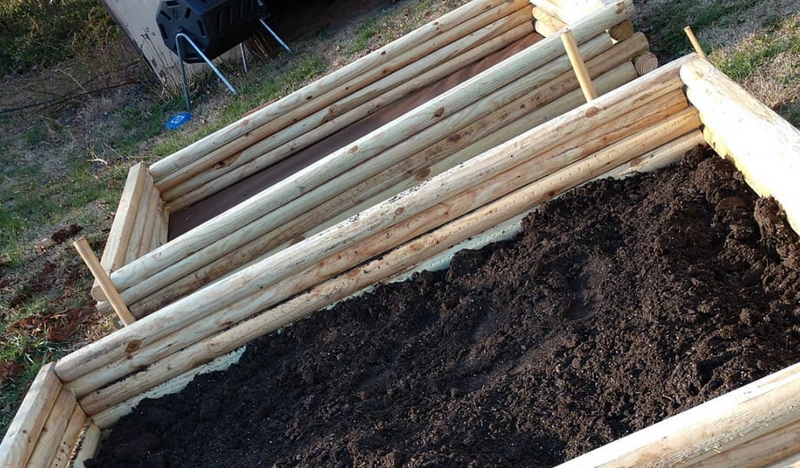 Denton made these garden boxes for him and his wife Amanda’s garden. He states, “My wife loves to grow green things, flowers, and food. So, I created these so we can plant them this year and grow some vegetables for our family.” He used 8-foot timbers stacked in overlapping ‘log cabin’ style. The boxes are 6×8 feet with a 3-foot walkway that will be paved for easy access. “This project took 40 timbers total and about 4 hours to do,” reports Deton. 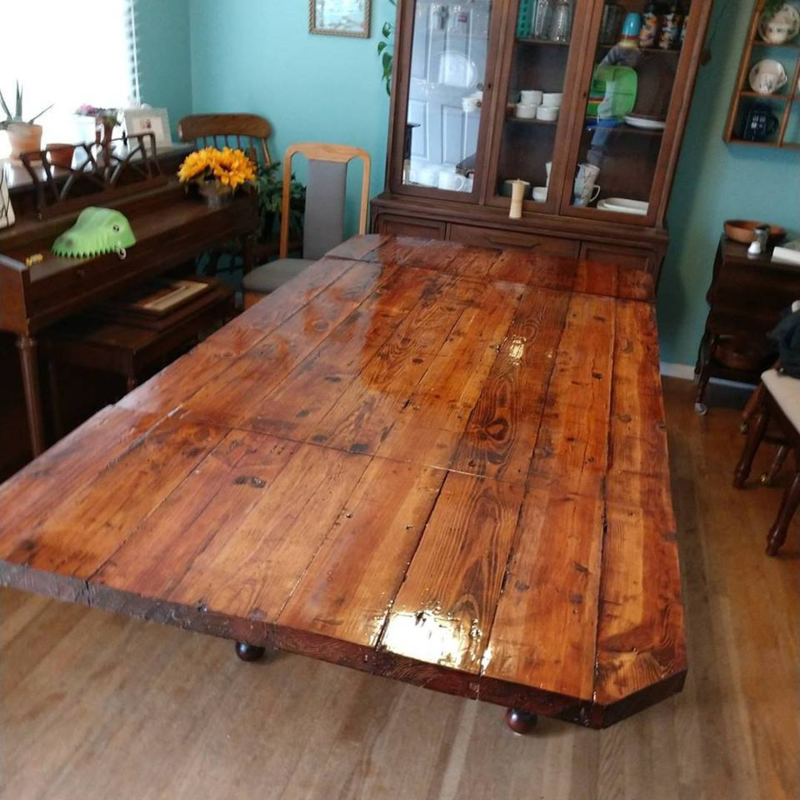 For this table, Denton used wood that he received from his father that had come from an old deconstructed 1908 bank building in Burlington, NC. He used staircase newels that were left in his garage to construct the table’s legs. “It took me a few tries to figure it all out, but it looks wonderful in our dining room,” says Denton. This project took him many months because he was working on it on his days off and often had to reglue and clamp the table top as he developed his process. “I was asked once if I would do another for payment. I answered, ‘No, but I’d do it for someone for the joy,’” he states. Denton noticed a pot holder at his mother-in-law’s house. He thought he could make one himself if he could come up with a pattern. “One day at a thrift sale at a local private school I saw one made of plywood, without the pegs,” he says. He purchased it for a few dollars and drilled through the cheap wood to create a pattern. He explains, “I used a piece of wood we had in the shop, a cast off from shelves my father had made. 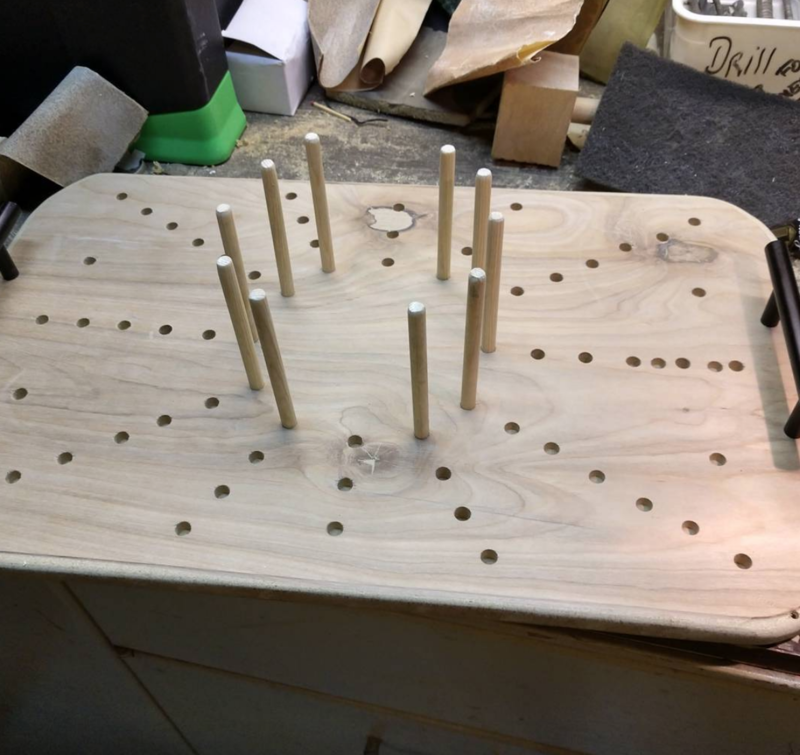 My drill press ensured the straight and even depth of the holes. 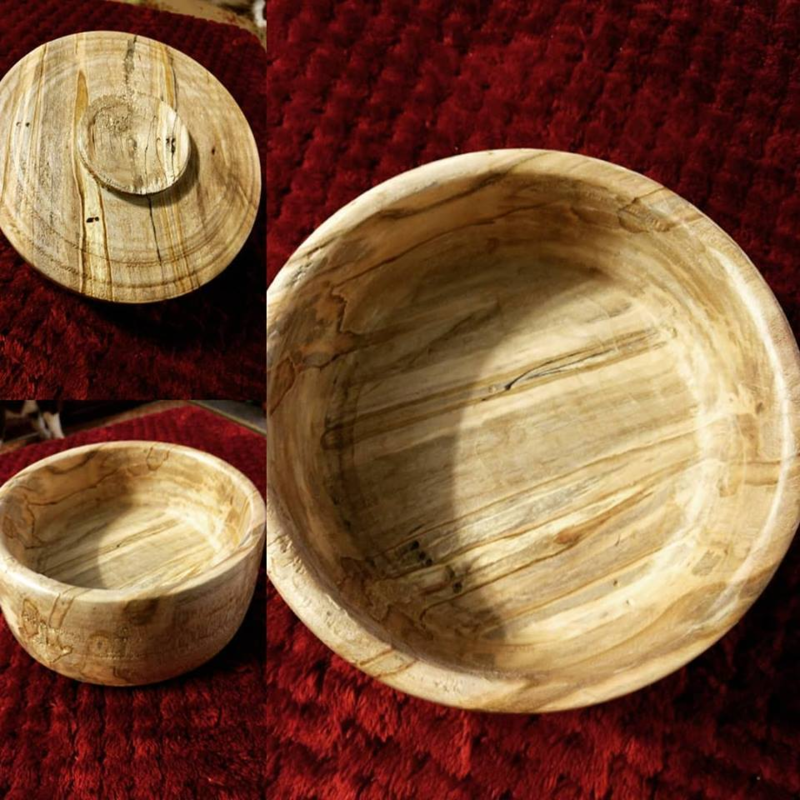 I sanded it with 600 grit paper and oiled it with linseed oil.” The functionality of the holder makes it easy to transport many types of pots and serves as a buffer for hot dishes.